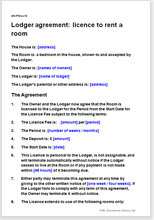 Use this boarder agreement to rent a room in your home to one or more people. This agreement creates a licence to use the property, with far fewer legal requirements for the landlord than a lease or a tenancy agreement. This document grants permission to one or more people to occupy a room in your home under the terms agreed. There is no requirement to have a formal written legal agreement with your boarder, but having one clarifies what the boarder can expect in the arrangement, and provides a reference point should any dispute occur in the future. Whether you’re renting a room to a friend for a month or two, or wanting a long term boarder, there are practical and legal advantages of having the rental terms in writing. In legal terminology, this document is called "a licence to occupy" and gives a boarder permission to live in a property without creating a tenancy. If you are taking a boarder in as a flat or house mate, this is the document you should use. We recommend granting a licence on a short-term basis (less than 12 months) and renewing it when it expires. It is suitable for any type of property: flats or houses, and can be used to let more than one room in the same property. You can reuse it for subsequent boarders. Taking a deposit (a bond) can be done (and is covered in this agreement) but we advise that if you can avoid doing so, you should. A court may see a bond as pointing toward this arrangement being a tenancy. Work in to your agreement the right for you to enter the room rented to your boarder at any time. Although this needs to be done discretely, avoiding giving the boarder exclusive occupation of the property helps identify your arrangement as a licence rather than a tenancy. Living with a boarder can be less pleasant once you’ve given him or her notice. Consider a short term. The expectation of a short arrangement will make giving notice easier (e.g. you can mention that you don’t plan to renew, rather than that you want your boarder to leave).